Before we look at human prenatal development, take a moment to reflect on how we make things. Are there any common denominators, or principles, that you can identify? For some thoughts on this, click here. But how does the embryo and fetus make itself? Is the baby developing according to a plan or blueprint? How does the baby obtain the raw materials it needs for development? Does the baby 'switch on' only at the end of development, or does it have to be functional at every step along the way? What sort of environmental factors might affect prenatal development? where does this complexity come from - is there a detailed plan from the beginning? how is the process of development controlled? what determines your role in the community: is it a genetic potential inherited from your parents, the result of environmental pressures, or a combination of both? as a member of a society (village, town, or nation), what influences you as you decide what to do next? what is the relationship between your goals, and the goals of the society as a whole? how is the developmental process controlled? what determines the role that each cell will perform? what is the relationship between genes and environment during development? how does an embryonic cell 'decide' what to do next? what is the relationship between cellular activity and development of the embryo as a whole? We have recently published a book that explores this idea that the embryo is a developing community of cells. 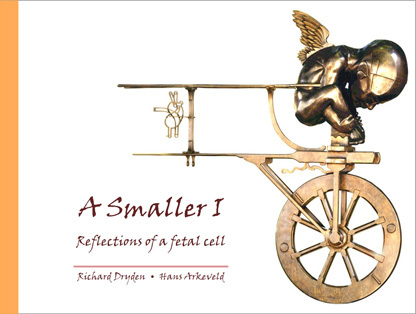 The book is called "A Smaller I - reflections of a fetal cell", and more information can be found here. Cells with nuclei contain a store of genetic of information. The DNA molecules within the chromosomes (remember - there are 46 chromosomes in human diploid cells) contain punctuated sequences of information referred to as genes. These genes specify the amino acid sequences of proteins that are needed by the cell. Remember that proteins are crucial to living systems. Some proteins contribute to the structure of cells, some take part in specialised functions such as contraction, and others are enzymes which regulate chemical reactions within the cell. Some proteins have a regulatory role within the nucleus and determine which genes are 'switched on' or 'switched off'. Some proteins are manufactured in cells and then exported to have an effect somewhere else in the body. The nucleus of the zygote (the fertilized egg from which the baby develops) contains genetic information from both parents. It has been suggested that this genetic store contains a complete 'blueprint' or 'program' for development of the individual. However, there are some difficulties with this view. For one thing, the cytoplasm of the zygote (which of course is derived from the original egg cell and is therefore of maternal origin) influences the earliest stages of development. Thus the genetic store is at least partially incomplete. Then there is the problem of explaining how embryonic cells develop into widely different cell types, even though they all contain identical copies of the original genetic store established in the zygote. Why is it that some cells become nerve cells, while others nearby become muscle cells? If the genetic store contains information required to produce all the different cell-types, then individual cells must in some way select only the information they require for their own pattern of development. This process of specialisation of cells during development is called differentiation. To make sense of this process of differentiation, we have to be aware of the sensitivity of embryonic cells to their environment, or surroundings. Our understanding of this sensitivity has come from numerous experiments. For example, if an immature cell is taken from one part of the embryo and put somewhere else in the embryo, it will tend to adapt itself to the new surroundings rather than continue along its original path of differentiation. Note the use of the adjective 'immature' - if the cell has already progressed a fair way to becoming a specific cell type, then it will show far less adaptability. Thus undifferentiated cells are very adaptable, and can respond to environmental factors, while more differentiated cells are less adaptable. In time, cells become committed to a given type of specialisation. (How does this compare with people, and the jobs they do?) The factors which actually influence individual cells are still being investigated, but presumably they will include the multitude of chemical compounds that exist in the intercellular fluid, and the interactions that occur between neighbouring cells. In some way, these environmental influences will help to determine which genes are 'switched' on or off in a given cell, and which proteins are generated. In recent years, molecular explanations have been found for many fundamental problems in biology. For example, we now have an understanding of the mechanisms of storage and copying of genetic information, transcription of the information onto molecules of RNA, and the translation of that information into protein structure. The techniques of molecular biology are now being applied to fundamental problems in development. Clearly, the DNA stores a very large quantity of genetic information. There is also convincing evidence that this information is essential for normal development. If there is a genetic error, or a chromosome is missing, or there is one chromosome too many, usually development will go wrong. The existence of a complete developmental program stored in the DNA, as has been proposed, would readily explain the differences between species, the subtlety and precision of family likenesses, and the controlled emergence of complex organization. However, there may be dangers in taking this interpretation too far. Some things happen during development that are not readily explained by this proposed developmental program. For example, on rare occasions, a pair of identical twins is born in which one twin is completely normal but the other has a major birth defect of some sort. As far as we know, the cells of both twins contain identical genetic information, and of course both twins have developed inside the same mother at the same time, and yet there are major physical differences between the two babies. This phenomenon is very hard to explain, but might show the effects on development of slight differences between one part of the uterus and another, or competition between the embryos for space at an early stage of development. Whatever the exact cause, this example illustrates a more general observation that the link between genetic information and the final form of the body is not a rigid one, and that development can at least be influenced by other, non-genetic, factors. Thus, although a primary source of information may be genetic, this is clearly only part of the developmental story. A suitable explanation of development should also encompass events leading up to and following on from particular genetic processes. We must take into account how certain genes are activated while others are repressed, and then consider the effect of influences within the cell, or coming from outside the cell, on the proteins that have been made. These moderating influences are often referred to as epigenetic events. We shall highlight next some of the embryonic processes with epigenetic qualities that are not easily reconciled with our present understanding of molecular processes. The development of a new individual begins when the sperm penetrates the egg and fertilises it. (In mammalian reproduction, the egg is still completing its development even at the time of fertilization, and is more correctly called an oocyte.) The single cell that is formed, the zygote, contains sufficient potential to undertake the complete developmental sequence for that species, from conception through to old age. Some hours after conception, the zygote in most species divides to form two cells, and then each of those cells divides again, and so on. With each cell division, an identical copy of the store of genetic information is passed to each daughter cell. These are called the cleavage divisions, because the existing cytoplasm is subdivided into smaller and smaller cells - there is relatively little protein synthesis at this time compared with the following stages. The cells resemble each other and appear structurally unspecialized (undifferentiated). If they become separated from each other, these early cells are each capable of forming a whole embryo. However, when they remain in contact as they usually do, or even if cells are added from another embryo at a similar stage of development, they all co-operate to form just one embryo. This highlights our first conceptual challenge - how and why do cells that are individually high in developmental potential co-operate to form a single embryo, thus giving up part of their full potential? An intense period of pattern formation occurs - morphogenesis - during which the three-dimensionaI shapes and forms of all the organs and systems of the body are established. Numerous processes are involved in morphogenesis, such as changes in cell shape, cell movement and migration, cell division and even cell death, folding of cell layers, aggregation of cells, and communication between cells. The second basic problem in embryology is to explain the emergence of pattern and form in the embryo, taking into account the limitation that the genetic store can only express itself by specifying proteins. One of the most remarkable findings of experimental studies is that - in many species - individual cells seem to 'know' where they are in the embryo during morphogenesis and are responsive to local cues. If relatively undifferentiated cells are moved from one location to another in the embryo, they generally respond to their new environment by changing their development appropriately to fit in with the new environment - they do not cling on to their previous direction of development which is now inappropriate. This is the third major problem in embryology - to explain how and why embryonic cells have this 'position sense'. There have been many attempts to explain this adaptability and position sense of embryonic cells. It is as if the cells are in some way immersed in an environment that guides their development. In the early years of this century, the idea of a morphogenetic field was proposed. This idea has been defined in many different ways by different people, and doubts have been expressed about its scientific value. To form an intuitive impression of a morphogenetic field it is worth noting that it has some parallels with the concept of a gravitational field. A gravitational field is produced by the presence of matter - there is an attractive gravitational force between one aggregation of matter and another. Matter will move if the field is not in equilibrium, and the movement will be 'guided' by the pattern of the field, but at the same time the movement of the matter will change the field, which takes on a new configuration. It has been suggested that a similar reciprocal interaction occurs during morphogenesis of parts of the embryo such as the head, arm, or leg. Thus, the cells respond to the guiding morphogenetic field which helps them to construct three-dimensional spatial patterns, but as they do so the field becomes modified. The simplest form of morphogenetic field would be a gradient of a particular chemical - cells at different points along this gradient could perhaps 'sense' or monitor their position by detecting the different concentrations of the chemical, and respond in an appropriate way. However, some descriptions of morphogenetic fields allow for much more spatial complexity than a linear gradient could provide. The cells forming different structures during morphogenesis become specialized to take on the functions that are required of them - muscle cells become specialized to contract, nerve cells to receive and conduct impulses, and so on. This is known as differentiation. The mechanism for differentiation seems to be a selection process in which only some genes present in each cell are actually used, or expressed. Thus, muscle cells 'switch on' only those genes that specify the proteins characteristic of muscle cells, while in nerve cells a different selection of genes is made. The majority of genes in a particular cell thus remain 'switched off' or repressed for most of the time. This of course raises the question of how the selection of genes is made. As differentiation occurs, individual cells begin to lose the potential to form all cell types and become increasingly channelled or committed towards particular 'fates'. Thus, potential is traded for differentiation. Some differentiation occurs during morphogenesis - for example, the muscle cells of the embryonic heart begin to beat even before the heart reaches its definitive form, but in other cases morphogenesis is completed first before differentiation becomes obvious. Here is the fourth basic embryological problem - if most of the nucleated cells in the same embryo contain an identical store of genetic information, which indeed seems to be the case, how and why is it that some become, say, muscle cells and other nearby cells become, say, nerve cells? During morphogenesis, things may go wrong. Cells may die when under normal circumstances they should not, or a step in the normal sequence of events may fail, or regions of the embryo may be damaged either by natural processes or by experimental intervention. Although the embryos of different species differ in their response to developmental errors, many have the ability to correct the error or compensate at least partially in some effective way, so that development may continue. This compensatory process has been named regulation. One example will serve as an illustration to underline this point - in this case the initial error is not totally corrected by the embryo, but the tissues developing after the error has happened adapt remarkably to the changed circumstances. Consider an abnormal embryo destined to develop only one eye instead of two, a rare condition known as cyclopia. The primary fault seems to be a reduction of the amount of tissue at the front end of the brain early in development. (This effect can be produced experimentally in chick embryos for example by removing a wedge of forebrain tissue.) This has a secondary effect on two bulges - the optic vesicles - which normally contribute to development of the eyes. The optic vesicles should grow sideways away from each other from opposite sides of the embryonic brain, but instead they become directed forwards alongside each other. As they extend forwards, they begin to merge and form a single, large optic vesicle. The fusion of the vesicles may be partial or complete. A visual impression of this may be gained by bringing two burning matches together and watching the changes in shape of the flames as they make contact with each other and fuse to form a single large flame. The presence of a single, centrally-placed eye means that other structures of the face - especially the nose and nasal cavities - cannot develop normally, and have to compensate for the abnormal situation. The tissues that would have formed the external nose are displaced and may form a tubular ‘proboscis' either above or below the eye. The nasal cavities are usually represented by a tiny, shallow pit. The skull develops a single orbit (eye socket) around the eye. However, even though the entire face region, skull, and brain are grossly abnormal in form and relationships, nonetheless the different tissues fit together accurately, they are viable, receive a functional blood supply, and do not give an impression of chaotic disorganization. How can this abnormal yet functional organization of tissues be accounted for? 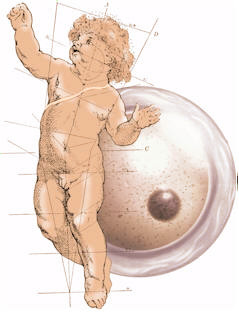 In the case of spontaneously occurring cases of cyclopia, it might be suggested that a fault or set of faults in the genetic store has produced the abnormal development, and that the galaxy of secondary defects of the head and face followed as a direct consequence of a genetic specification of cyclopia. But then, an explanation of this sort does not sound convincing in the case of cyclopia produced experimentally, for example by excising a small wedge of brain tissue from a genetically-normal chick embryo. In this case, as far as we know, there is not any direct modification of the genetic store. The cells that remain in the embryo after the operation would have gone on to form a normal embryo, had the operation not been carried out. Faced by what has become an abnormal situation, these cells seem to make the best of things, and instead of blindly following a developmental program that is now inappropriate they co-operate in an innovative way to construct a face with a single eye and orbit. The flexibility of response shown by cells during regulation is sometimes quite remarkable, especially when it occurs during the earlier stages of development, and gives a strong impression that development involves the use of a flexible strategy by the embryo, rather than a strict program. It is as if the embryo possesses a quality of 'wholeness', whereby it can overcome or bypass localized errors and aim towards a final shape and form. The emergence of pattern and form within the embryo does not seem to be simply a product of the activities of single cells responding to an internal genetic program. Now, from a scientific viewpoint, any suggestion of 'goals' or 'wholeness' is unacceptably teleological, since these terms imply that the embryo is somehow purposeful or rational. (Teleology: the view that changes are due to purpose or design.) Although this attitude may seem counter-intuitive, many important advances in science were made when appeals to purpose were abandoned. Here then is the fifth embryological problem: in those embryos that regulate after errors or trauma, how do the remaining cells 'know' what to do in order to compensate? To summarise, there are aspects of development that are difficult to explain as a consequence of a genetic program unfolding in the embryo. These are referred to as epigenetic processes. The development of pattern and form, the power of regulation, and the emergence of differences between cells even though they contain the same store of genetic information - these do not fit easily with the idea of a strict genetic program. Or do they? We know that the genome can determine protein structure. It can also perhaps determine when particular proteins are made, in which cells, and in what quantity. But is this enough for a developmental program? Can a program which has proteins as its only form of expression generate the subtle structural differences between regions that apparently have the same biochemical composition, for example, the detailed differences between a left arm and a right arm, or between an arm and a leg? Our understanding of development is increasing at a dramatic rate. In recent years clusters of genes that control pattern and shape in the early embryo have been identified. They are called homeotic genes since they all contain within their length a sequence of genetic information that is the same. It is this sequence which gives the proteins they specify the ability to interact directly with chromosomal DNA. Therefore the proteins derived from homeotic genes play a part in determining which genes are active or inactive - they are transcription factors. At first, homeotic genes were found in the fruitfly (Drosophila), but then it became clear that they are present in most (if not all) other species, including the human. Thus, successful developmental strategies have been conserved throughout evolution. We have also discovered that genes only make up about 2% of the human genome, and the remaining 98% - originally dismissed as ‘junk DNA’, is now being looked at more carefully. It appears that this non-protein-coding DNA specifies small molecules of RNA that have key regulatory functions within cells and embryos.